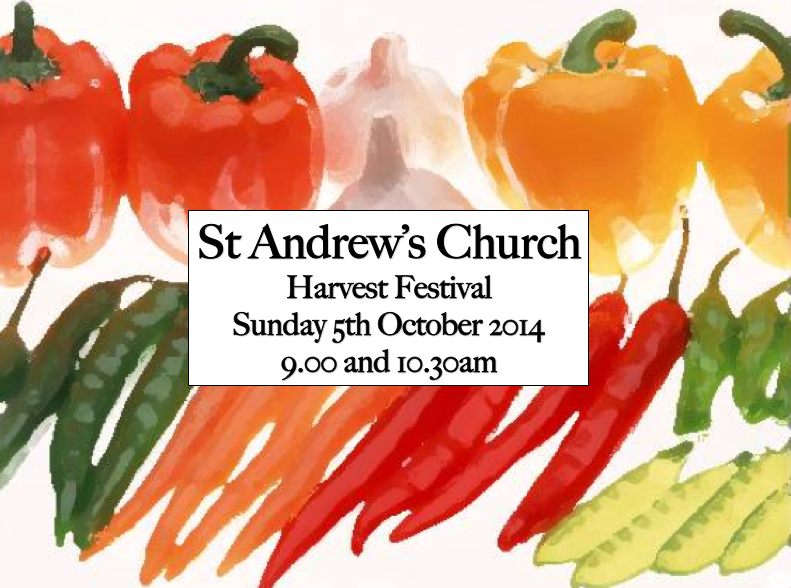 St Andrew’s Church Harvest Festival Please join with us for our annual harvest celebration. Our services are open to everyone of all ages – everyone is welcome! As well as having celebration services, we collect in food and toiletries for the vulnerable in our community. If you would like to bring anything to help those in need, then the following would be most welcome – any tinned food, tea, coffee, long life milk, rice, soap, toothpaste, toothbrushes, razors, shampoo, tissues, wet wipes, tissues, nappies. These can be brought to the services on Sunday morning. The church will be open while being decorated on Saturday 4th October 11am-1pm, please do just drop in to see the church!